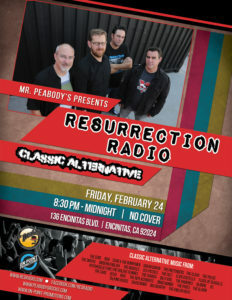 Come join our inaugural visit to Mr. Peabody’s, a classic Encinitas spot. We’ll be unveiling a few new tunes as well as bringing our regular mix of classic alternative songs. We’re super-stoked to be playing here and to give our North County friends a little closer venue. That said, there’s nothing like our San Diego and La Mesa friends making a short trek up the 5 to kick off the weekend in style. Let’s pack the lace out and make this a regular spot to bring classic alternative music to the entirety of San Diego County. Special thanks to the team at On Point Promotions for bringing us to Mr. Peabody’s. To be fair, lace WAS a big part of ’80s fashion.